The Walk: The good old British weather. It's the most talked about subject of the nation, a national pastime. I think to myself "Why do we moan so much about it". Our climate provides us with the treasured landscape we have. I much prefer the lush 'green and pleasant land' countryside of England to the parched pale greens our mainland European neighbours have to live with. We should celebrate it more than we do and stop being a bunch of moaners. I can see it now, a summer weekend. Michael Fish has promised us a nice weekend. The house next door (could be any random house) have just bought a new barbecue and invited the neighbours to dinner. The day has been brilliant and as the man of the house goes out into the garden to light the barbie a few wispy clouds appear. He has a little trouble getting the hang of lighting the briquettes. After half an hour he has finally got it going, just as the sun disappears behind a cloud. Still there is plenty of blue sky up there, it will be fine. The barbeque hots up nicely and after a further half hour the lady of the house takes out the chicken legs, pork kebabs, sausages and veggie burgers. She settles them on the grill and they start to cook. The neighbours arrive. More clouds arrive. The beers come out for the lads and the white wine is uncorked for the girls. The lads chat in the garden, the girls in the house. The man of the house turns the food. It's cooking perfect. Darker clouds are settling overhead. "Was that a spit of rain" says a neighbour. "Yes, I felt one" say's another. It stops. "Just a passing shower" says the host hopefully. The girls join the boys in the garden. "Ten more minutes for the food" says the host. As he speaks a loud bang is heard. Then another. Then a bright flash. Then another. Large droplets hit the garden path. (move to 10 minutes later) The barbecue is now out. There is a river running down the garden path. The host is soaked to the skin. Everyone is huddled indoors. The food has been rescued and the party are eating off paper plates. The hosts looks skywards. The clouds part. The sun comes out. A typical British barbecue has just occurred with it's almost inevitable summer storm. Don't we just love the unpredictability of our climate. Let's get walking. We left our digs in Thoralby and walked off into the rain. We were prepared. It had been forecast last night. We continued our crossing, now Thoralby Common, still in grim conditions. Sparkling conversation kept our spirits high as we wandered from one interesting subject to another. I forget them as soon as they are over until we spot Busk Lane and turn south on reaching it. As we turn we get our first sights of a large hill in the foreground. 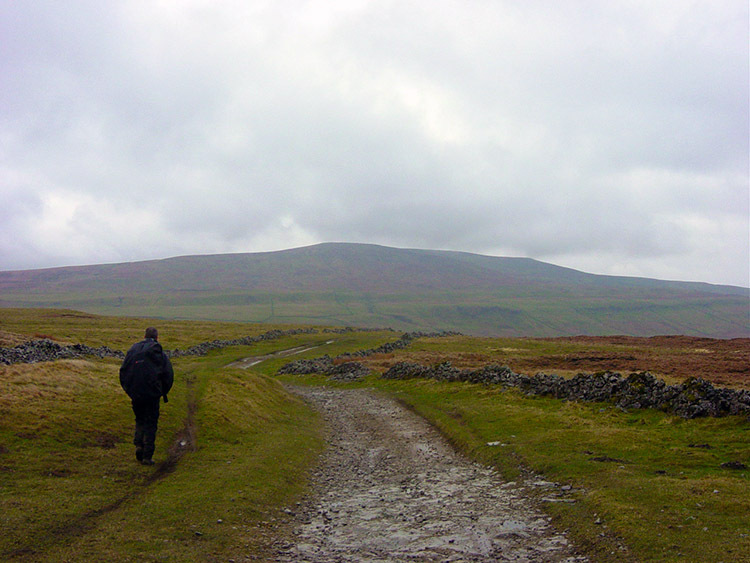 It has to be Buckden Pike. We begin a discussion about our times up there. We always remember one time, the only time we have been driven off a hill by the weather. As it continued to rain down on us we recalled that time when Dave, Steve and I attempted to climb the Pike from Buckden a good few winters ago. We had driven over on a fine winters morning. As we began the walk it started to snow, gently at first. 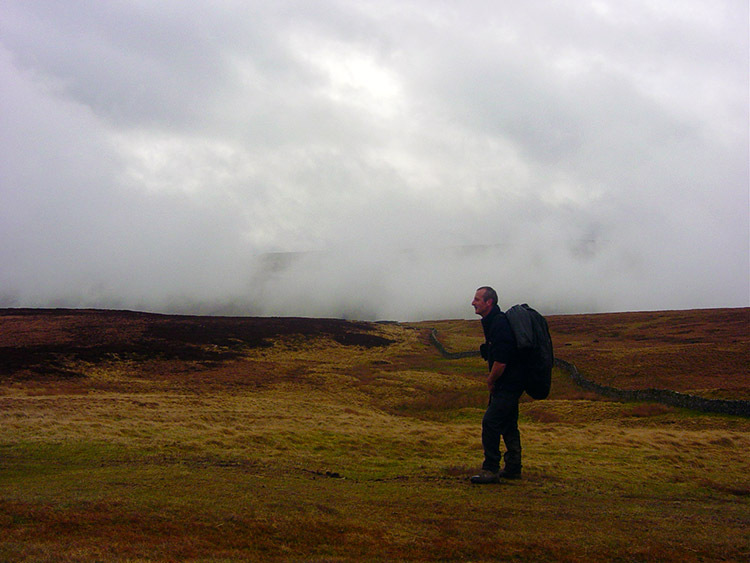 We had only gone up Buckden Rake for about half a mile before it began to get heavier. We kept going up. As we left the Rake track to climb steeply eastwards to the top it got heavier still and in no time at all it was a whiteout. We climbed on for a short distance until we reached a point where we passed all the sheep on the fell who were on the way down. It was impossible for us to continue so we decided to follow the sheep. 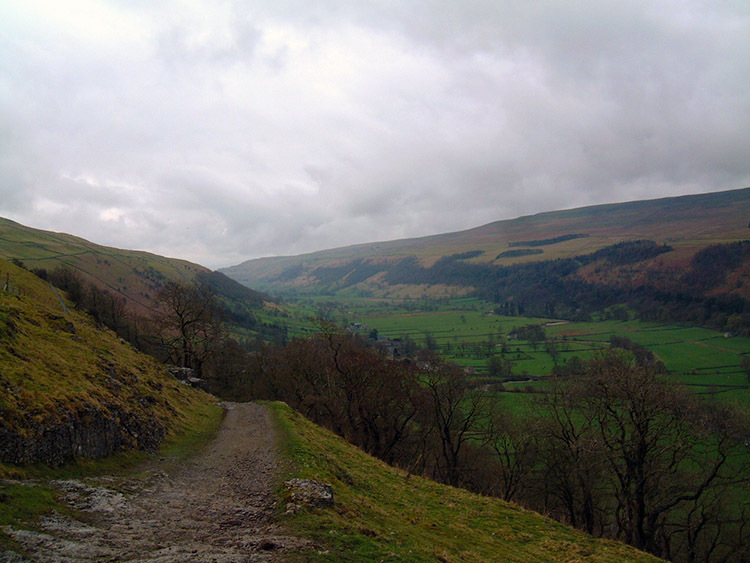 We descended back to Buckden Rake and huddled behind a wall. Our clothes were covered in white as was the beard Steve wore at the time. We conceded defeat, giving up any hope of making height and sought out an alternative. 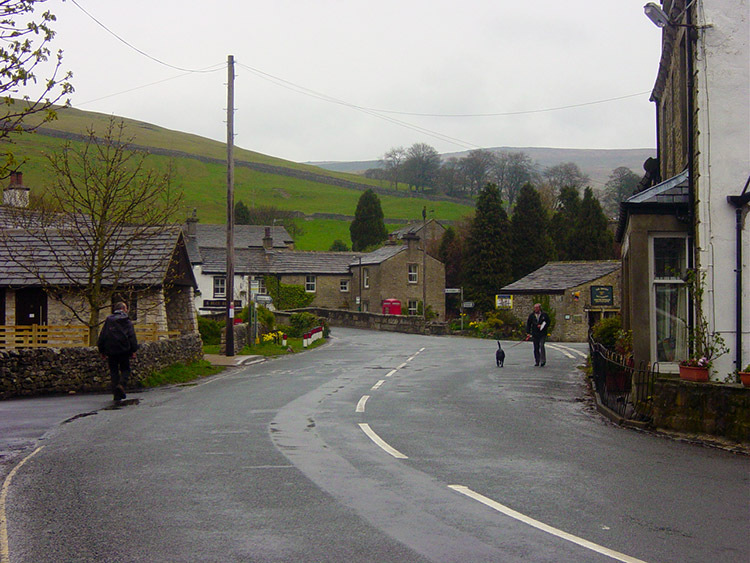 We walked the area around Cray, Yockenthwaite and Hubberholme before seeking sanctuary in the pub at Buckden. As we sat around the roaring open fire our coats and outer clothing was discarded to dry. Three large puddles on the tile floor remained as evidence that we had been saturated. As we continued our reminiscing Steve and I agreed getting wet was still worth it. Walking is always worth it and it wouldn't be the same without a day as wet as this once in a while. We walked on down Busk Lane still getting wet. After walking south down Busk Lane for about a mile we joined Gilbert Lane. The lane is a byway open to all traffic although I would not attempt to bring my car on it. Such a byway is indicated in Ordnance Survey by a cross-dashed green line. Steve said this indicated a roman road. I doubted it as it was not straight. Looking at the map confirmed my views. Yet another attempt from Steve to 'pull the wool over' (recall the first day and the stone martin yarn) It's one of my favorite fantasy games to try to work out which of Steve's stories are true and which are pure fiction. Don't stop trying my friend. As we walked down Gilbert Lane it continued to rain. We had not seen a glimpse of any blue sky today. I was sure we were not going to now. With the rain abating a little (but not stopping) we passed a small limestone outcrop. We were passing Stake Moss. After this we started to drop steadily. 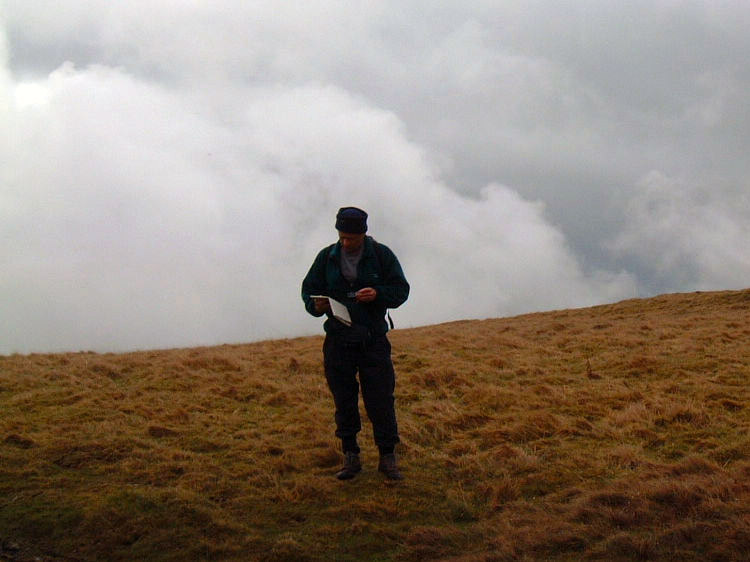 We were now beginning the descent proper into Upper Wharfedale. After a further mile on the Gilbert Lane byway we joined a metalled road which links Wharfedale and Wensleydale. We could have followed the road all the way from Thoralby to this point. We were never likely to. After following the road for about a half mile we left it and cut towards Buckden Rake. 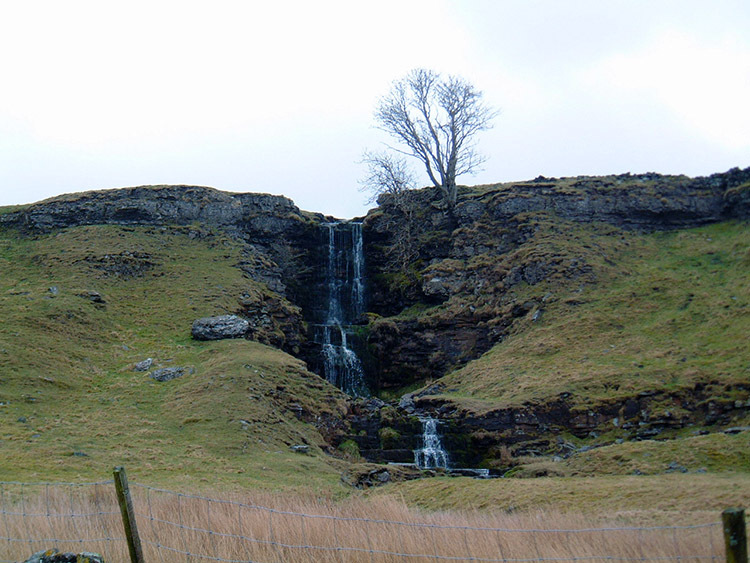 As soon as we had left the road we looked over to the pleasant little waterfall seen in the picture up the page. After yesterdays excess of water features at Aysgarth Falls this was the first time we had seen water at all today, apart from the puddles we had traipsed through on the moor that is. 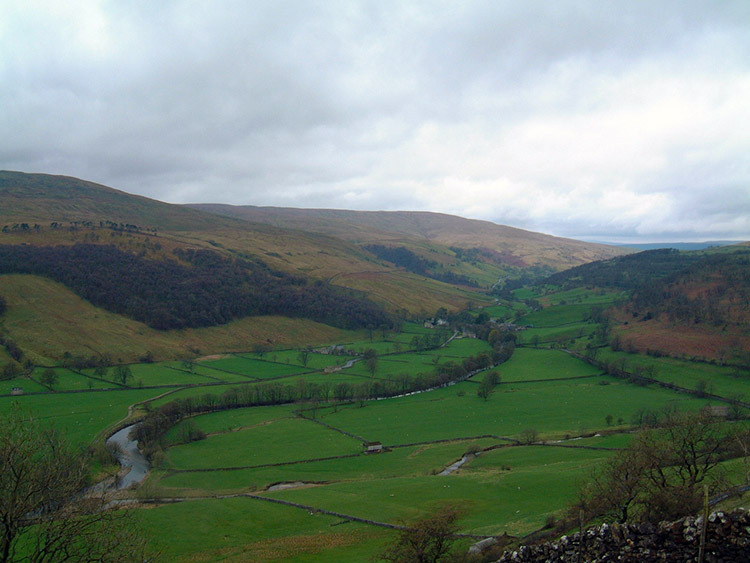 We made our way along Buckden Rake and passed by the village of Cray slumbering below us to the right. We walked on towards Buckden. As we made the last half mile we passed a farmer riding a quad bike up the track. two sheepdogs ran ahead of him. "They are too fast for you" I said. "Aye, but I'll tire the clever buggers out" he replied. We laughed. Steve and I then walked into the village and made straight for the shop. Thankfully it was open. I was not going to suffer 'the shite' today. Joyously the shop sold warm pies and pasties. Just what the doctor ordered on a miserable damp day like this. We bought plenty and wandered off to eat our hot lunch beside a bridge linking Buckden to the peculiarly named Langstrothdale. As we did so the rain stopped giving us a brief but most welcome respite. The food was delicious. We sat on a pebble bank at the side of the bridge next to the River Wharfe. I recalled another time walking in rain. I was not part of the walk but Steve and a friend of ours called Richard Jones once walked in the Buckden area on a day when it poured down. Steve and Richard have both told me the story of how they cowered under this very bridge while it rained and rained and rained. The wet was very much in our thoughts today. 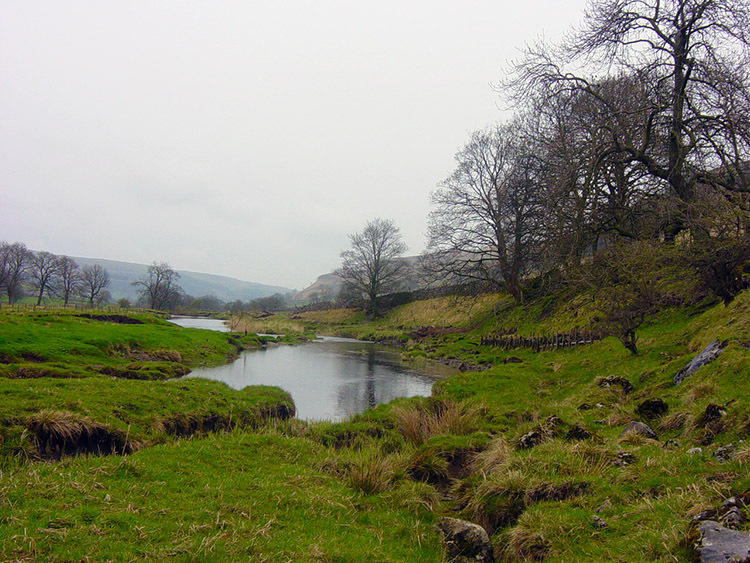 We finished our tasty lunch then prepared to move off on the final stage along the Wharfe following it downstream (on the Dales Way) all the way to Kettlewell. As we crouched under the bridge to make the path on a narrow bank I stepped onto a stone, I slipped off it and fell into the river. Luckily I did not go completely under but I was in it up to my knees. I was hurting too as I had scuffed myself on the stone as I slipped. I was motionless in the water for a few seconds as I became aware of what had happened. As I did so I felt water ooze through the tops of my boots and fill them. It's a horrible feeling. As if I was not wet enough before! Steve expressed concern as I had hollered in pain when I had slipped. 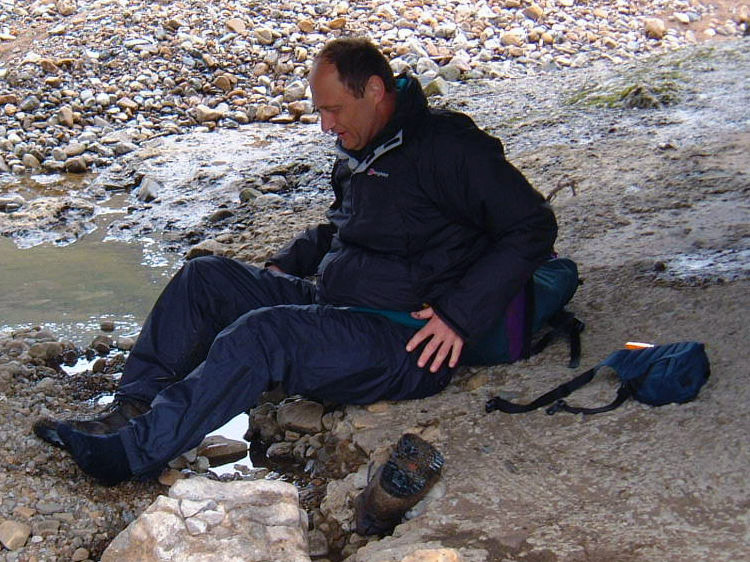 I reassured him I was OK but had to stop for a while to change my socks and drain the boots. Slowly I did just that and after limping for a few steps on the resumption of the walk the pain eased and I thought no more about it. 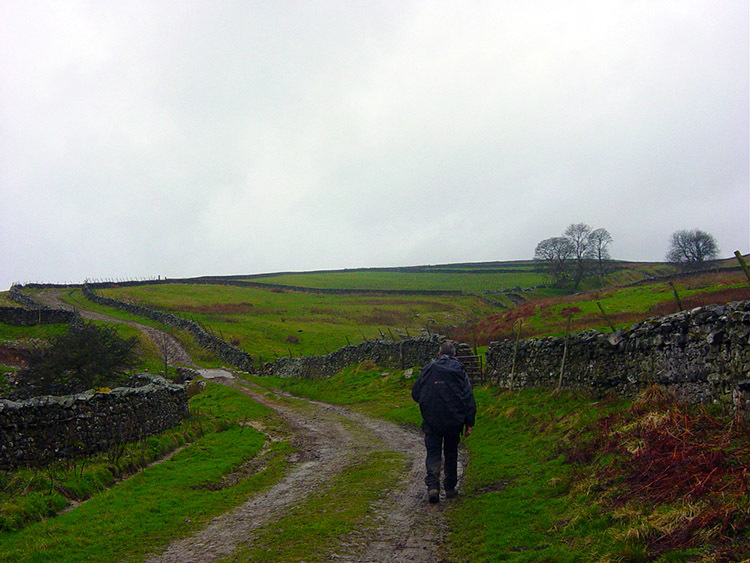 It remained wet and drizzly as we walked along the river from Buckden, past Starbotton and towards Kettlewell. The constant rain had turned Upper Wharfedale a deep green. Birds were aplenty near the river and we watched them from time to time as we walked on until we arrived in Kettlewell. It was still raining. We made straight for our digs. When we arrived looking like drowned cats our host Mrs Thornborrow exclaimed " oh heavens, my poor pink carpets" We tried to keep them clean and picked all the excess mud up. We tried to dry ourselves as much as we could but still felt damp, only ridding the feeling by taking a warm shower. We then went out for our last evening of the walk. It was still raining. It never stopped.